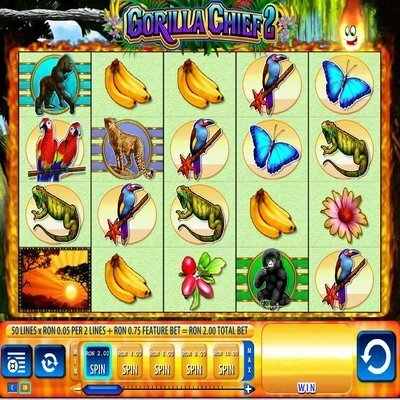 [miau] Gorilla Chief 2 is a free to play online slot machine game with a five reel, fifty pay line attribution. The game engine for the virtual slot is powered by WMS Gaming. Pay in ranges greatly, from the very low (40 p) to the very high (200 pounds sterling or $ 313.79 US Dollars). This versatility of pay in makes the game very accessible for new online gamblers as well as interesting for old time players whom which to go all in on the first couple of spins. The layout of the game is jungle themed and extremely colorful with lots of vibrant greens, yellows, reds and oranges. Primary symbols are the Gorilla, A Banana, A Parrot, a jungle flower, a jungle fruit, a lizard and a sunrise jungle vista with trees to the foreground. One of Gorilla Chief 2’s big draws is it’s bonus spin feature. Gorilla Chief’s bonus spin round triggers whenever all of the same symbols which appear on the first reel appear on all of them in a matching row. Once this happens you will receive two free respins. However, the first reel’s symbols will be held during the first and second bonus spins. This, of course, means that the first reel will not move at all during the bonus rounds which increases your chances markedly! It is possible to win two hundred times your initial bet, or more, on nothing but the bonus spin round alone! Another free spin round is also triggered when you have matched three sunset symbols together on the first, second and third reels. Doing so will cause the bonus spins to trigger, granting the player a grand total of ten free spins. However, unlike in the previous bonus round, in the sunset one all reels spin normally and none are specifically held. To compensate for this, however, a number of additional gorilla symbols are added to bolster the win and payout potential for the player greatly. It is possible (but very rare, to receive a unlimited number of free bonus spins by matching the gorilla symbols on reels one, two and three. Perhaps best of all is that both bonus spin rounds are not mutually exclusive. This means of course that you can, say, match a sunset on the first, second and third reels and go from their to matching three gorillas in a row on lines one through three. This allows for potentially unlimited stacking of free spins and a much, much higher likelihood for a big bonus payout at the end of it. So be sure when playing the game to keep your eyes peeled for the wilds! Like most online slot games Gorilla Chief 2 is available on many different sites for free, typically without the need to download any software before playing (and always be wary of sites that insist on making you download something to use their content). In addition, it is very easy to play but there are a buttons that need a brief overview before playing though most people will be able to deduce their meaning. Help and Pays: This informs you about various payouts and free spin rounds. In addition, it also explains wilds and scatters. Auto play feature: This button should be reserved only for advanced players with a specific and refined betting style. QB: This is the Quick Bet feature to help jump straight into the action. All said and done Gorilla Chief 2 is a very solid, easy to play and fun to win online slot game that is highly recommended for both seasoned and new players.